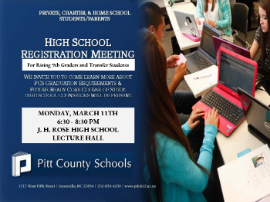 All private, charter, homeschool students and parents, transfer students and anyone who is interested in the high school registration process is invited to attend our high school registration meeting. We invite you to come learn more about PCS graduation requirements and future-ready core course of study. High school counselors will be present.